Globe Telecom once again offers free Facebook to their prepaid subscribers. The Globe free Facebook has been enjoyed by Globe users last October 2013 and had ended later than actually planned in the first quarter of 2014. Globe posted in their official Facebook page that the free service is back starting next week, a few hours after rival telecommunication firm Smart announced their free internet service of 30MB for Smart, Talk n Text and Sun subscribers. With Smart however, users can not only use Facebook but can also browse other website such as search engine Google, online shops and live stream music. With these giant telecom companies giving free data usage, Filipinos would be able to enjoy Facebook app without worrying about charges, however, there is a catch. Subscribers would be charged for viewing videos on YouTube, using chat apps, downloads and video calls. 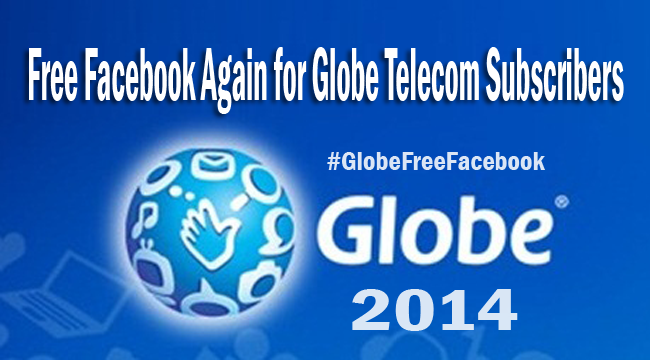 According to Globe, they had pioneered the free FB service and it is a compliment that rivals had followed suit. They had considered this as a compliment and wished them good luck. Furthermore, Globe considers that the more Filipinos using internet, the more better it is for the country and the ecosystem. Though no more further details were posted, Globe would surely give follow ups to their consumers in the coming days.